Burhill juniorsin Wins The Nations Home title In Portugal. 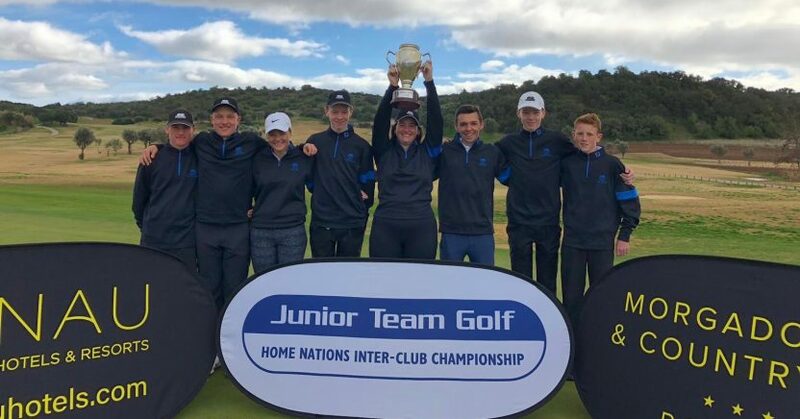 The Champions of Portugal Burhill junior returned home as champions after claiming a hard-earned triumph in the Home Nations Inter-Club Junior Team Golf Championship at Morgado Golf & Country Club in the Algarve, Portugal. The team held their nerve over four days of competitive game play to claim the club’s first international victory, beating off competition from the best junior teams from England, Scotland and Wales. As runners-up in the England National finals, Burhill’s victory represents a concluding action of months of hard work and focus from the gifted young players and their managers. The championship final was an all-English amour, with Burhill emerging with a 3.5-2.5 win against their opponent from Huddersfield who had previously pipped them to top spot in the England National finals. Ben Wilson and Jess Adams recived the Steve Redgrave Award for best category 2 player and was also recognised for her sterling performances with the trophy for Best Performing Girl. After the presentation of the individual awards, the Burhill juniors went up as a team to collect their overall accolades – they all received a Cleveland wedge, towels, balls and individual keepsake trophies. The team players consisted of: Sasha Crockett, aged 16 (Captain); David Gurr, aged 18; Thomas Hawke, aged 15; Harley Yates, aged 15; Elliot MacGregor, aged 15; Ben Wilson, aged 14 Jess Adams, aged 17; Matthew Hawke, aged 15.